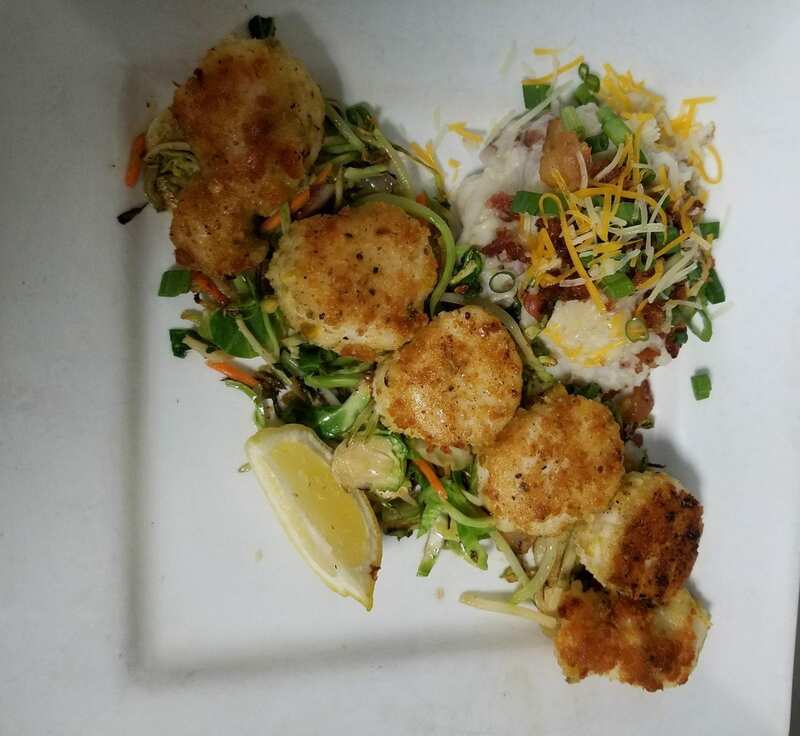 The Sunset Grill of Little Harbor in Ruskin embraces the most intimate shoreline of Tampa Bay, featuring phenomenal sunset views to enchant everyone who dines there. In real estate the key to success is “location, location, location.” In the restaurant business, success hinges on fabulous food and fantastic service. The Sunset Grill offers it all — sandy beaches, indoor and outdoor seaside dining complete with a Tiki Bar, as well as live entertainment from 6 to 10 nightly. It is open for breakfast, lunch and dinner, 365 days a year. Upon entering through large double glass doors, one can’t help but notice certificates proclaiming “Excellence” and “Best of” displayed on the wall. 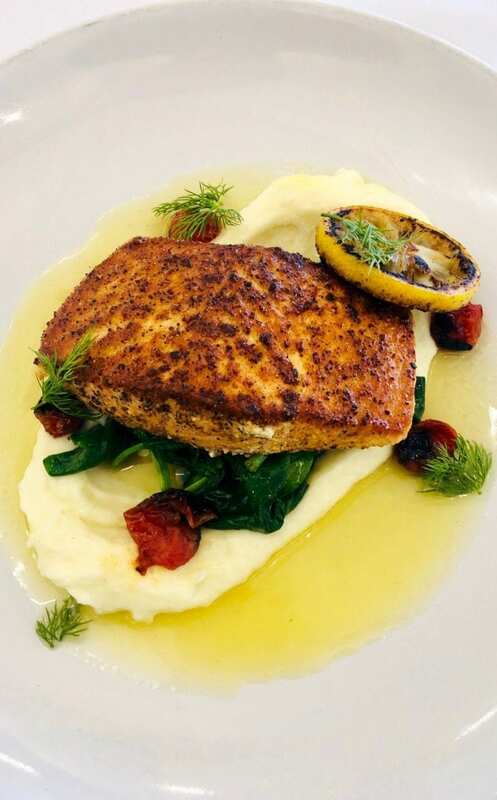 Executive Chef Oscar Larry began his restaurant career as a dishwasher at the age of 14, washing dishes in Tampa, where he was born and raised. By his senior year in high school he was Assistant Kitchen Manager at the Sweetwater’s Oyster Bar, overseeing a staff of 24. “Some of them were much older than I was at the time,” he smiled. Later, Chef Oscar owned his own restaurant and a carry-out location, working not only as manager but also as the chef. He ultimately realized being a restaurant owner took too much time away from his love of cooking. “I love cooking more than money,” he explains. So, rather than burn out, the Sunset Grill’s chef made a life decision to return to his passion, preparing food to delight customers. Chef Oscar joined the staff at Sunset Grill three years ago as a sous chef, rising quickly to Executive Chef. He currently oversees three other chefs and takes charge of designing the menu, which he changes quarterly to offer creative new dishes. He likes making “table visits” to learn what customers find the most satisfying and delicious. As we sipped our pleasing house wine (Copper Ridge), we were invited to the soup and salad bar. We particularly liked the robust, flavorful chicken vegetable soup. The Sunset Grill’s nice selection of appetizers included Loaded Sidewinders, fries topped with pulled pork, scallions, bacon, and cheese sauce. We also enjoyed blackened ahi tuna, topped with a green seaweed, a delightful first for my taste buds, served with wakame, wasabi, siracha and a soy reduction. In an effort to sample the variety available at this delightful restaurant, I also chose the “tiki skewers” of shrimp, mildly blackened and enhanced with fresh pineapple. The crab cakes, with a light wasabi cream sauce, were delightful. All the appetizers were tasty and generous. We could have stopped there but, oh, what we would have missed! For our entrees, I selected the “fresh catch of the day,” pompano garnished with wasabi sauce, and nestled in mouth-watering coconut rice, accompanied with honey glazed green beans. My husband chose pistachio encrusted large sea scallops served with loaded mashed potatoes and marinated vegetables. I was surprised my husband enjoyed the potatoes as much as the showpiece scallops. Dessert choices included a house-made New York Cheesecake and a seasonal creation (changing daily) featuring local fresh fruit. 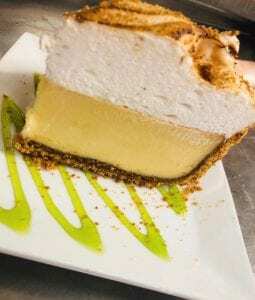 But the highlight, offered with obvious pride and joy, was their very own Key Lime Pie–not too sweet and not too tart, topped with a light meringue. 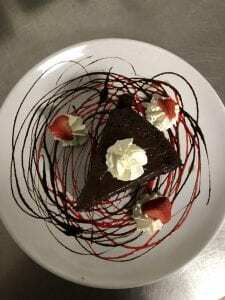 Perhaps our next visit will be for the renowned Sunday Brunch (8:00-2:30), which features an ever-changing menu, often including crab claws, raw oysters, a meat-carving station and chocolate fondue, for $25.95. For only an additional $4.95, the glasses of champagne or mimosas become unlimited. During our leisurely dinner, a well-prepared group of servers, wearing tee shirts featuring the restaurant’s very own sunset view from the Tiki Bar, attended to their customers. Their courtesy extended not only to caring for guests but to each other while they worked together to provide excellent service. The smiles on their faces complimented the relaxed, casual, yet professional beach-side dining experience at the Sunset Grill, 602 Bahia Del Sol Dr. in Ruskin. For other great restaurants in the Tampa Bay Area consider Guppy’s or Alesia.